By now just about everybody under the age of 100 sends and receives email. I have several email accounts and just about every day I spend quite a bit of time reading, replying or deleting incoming email. Then you have your archives and files you want to save and/or print. Gimme a break! So how do you keep in contact with your prospects and customers? Some of you call them, some write them letters or notes, some just plain forget to do anything to keep in touch and then there is email. 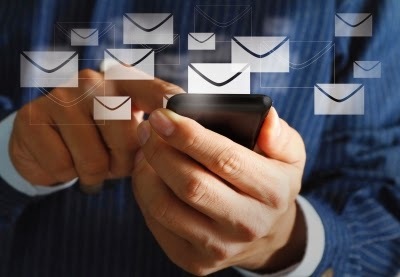 Email is now the 'Go To' method of staying in touch with customers, suppliers and prospects. 1. MAKE IT EASY FOR SOMEONE TO EMAIL YOU. I have been preaching that having your email address on your website is critical. Put yourself in your prospects shoes and take a look at your site. A lot of you don't even offer an email address, you make people fill out a mind numbing form and hit "submit" to get in contact with you. I immediately cross these sites off my list and so do a lot of visitors to your site. Having an email address with info@joe's homes.biz is just as bad. Who is this person and why did their parents name them "Info"? 2. RESPOND QUICKLY. If you get an email that needs a reply, do it! You might want to think about it and respond later and that's OK if you do within a day however the chances of you remembering to do it diminish in direct correlation to lapsed time. After 24 hours you'll probably never reply to it. Then you have to make the universal excuse to the sender when they call you..."My Internet was down!" Yeah, that's what happened. 3. KEEP IT SIMPLE. I receive email from people that think that every email they write is a literary masterpiece. After 10-20 seconds if they don't get to the point, it gets deleted. Sorry, but I also tune out people that just go on and on without saying anything. 4. AVOID SENSITIVE ISSUES. If there is something that needs a decision immediately, call them! Leaving time sensitive and personal things to email can be disastrous. Email is not the cure for direct communications. I have heard of people being told a family member had just died and others were told they were fired by email. Really, that's a low blow. 5. STOP SENDING FORWARDED MESSAGES. This is a real pet peeve of mine. I don't open them. They probably contain a virus or something. What would happen if your prospect or customer got one of these from you, opened it and it uploaded spam and viruses into their computer? Guess who won't be buying a house from you? 6. PERSONALIZE THE SUBJECT LINE. You only have one shot at getting someone's attention in an email. Make your subject short and pertinent to the subject. Your prospects and customers are different than your friends. Unless they ask you to send them junk email, keep the emails on a professional level.